The Hatsan AT44 is a very good value for money precharged pneumatic air rifle from Hatsan who are based in Turkey. The AT44 features an easy to remove air reservoir with quick fill and a in built pressure gauge so you always know how much pressure you have. The precision rifled steel barrel is screw cut with a ½inch UNF Thread for easy fitting of a silencer, also a Thumbhole synthetic stock which is very comfortable to hold as well as very finely balanced. 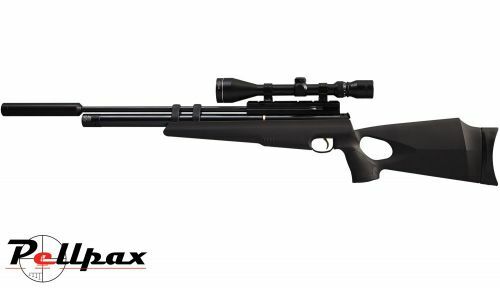 All of the hatsan AT44 rifles feature an anti-knock system which helps prevent gas loss when it is knocked or bounced. As well as this, a two stage adjustable trigger with a crisp let off and side handle cocking lever is fitted for smooth cocking and reloading. An auto safety is also featured make which makes this a very safe rifle. With a 10 shot magazine for fast and easy reloading is simple and easy to use, and the detachable air cylinder is a great bonus which allows you to switch the cylinder to continue shooting when you are away from your air cylinder. An anti double load feature is incorporated into the rifle to prevent any pellet getting jammed in the barrel. The breech is grooved for both 11mm and 22mm scope mounts for great flexibility.